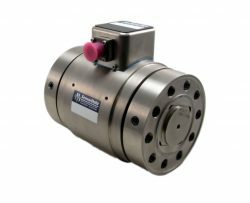 SensorData Introduces Industry’s First True Dual Range Rotating Torque Sensor Series | SensorData Technologies, Inc.
SensorData Technologies is pleased to announce the global market introduction of the Dyno LaborSaver™, the industry’s first true dual range rotating torque sensor series. These high-performance torque sensors features a 5:1 ratio capacity of zero to ± full-scale, with a range of measurement options that are completely unique to any other comparable technology on the market. Traditionally, test engineers and technicians involved in dynamometer or other rotating torque testing would require the use of two separate rotating torque sensors, in applications where a wider range of product must be tested. The new Dyno LaborSaver™ series allows for dual measurement capabilities and extended capacities, allowing it to accommodate most dynamometer testing requirements as a single unit. This significantly reduces downtime on the test bench, as well as overall test costs, by eliminating purchasing requirements for multiple torque sensing units. Available in six base models and with a variety of customization options, the high-bridge Dyno LaborSaver™ series is offered in standard ranges from 100 to 500,000 lb-inches. The low-range bridge is available in capacities from 0 to ±1/5 full-scale of the higher range. Units feature high-accuracy on both distinct bridges. Voltage outputs may be either simultaneous for both bridges; or selectable to suit customer requirements. The high torsional stiffness of this product range, as well as its reduced rotating inertia, allows for increased frequency response. Its relatively compact size allows for ease of installation and space reduction, as units occupy an overall footprint that is far less than torque sensors of equivalent ranges. For a detailed list of customization options, please consult factory. The true, wide dual measurement range of the Dyno LaborSaver™ makes it ideal for use within dynamometer test stand applications, particularly ones in which sensor access may be limited by space or installation environment constraints. In addition, the product is suitable for low-range torque measurement requirements, in applications where high torsional spikes may occur. Product delivery is available for 8-12 weeks ARO. Expedited orders may be available upon request. For additional details, specifications, drawings or pricing information, please contact SensorData .